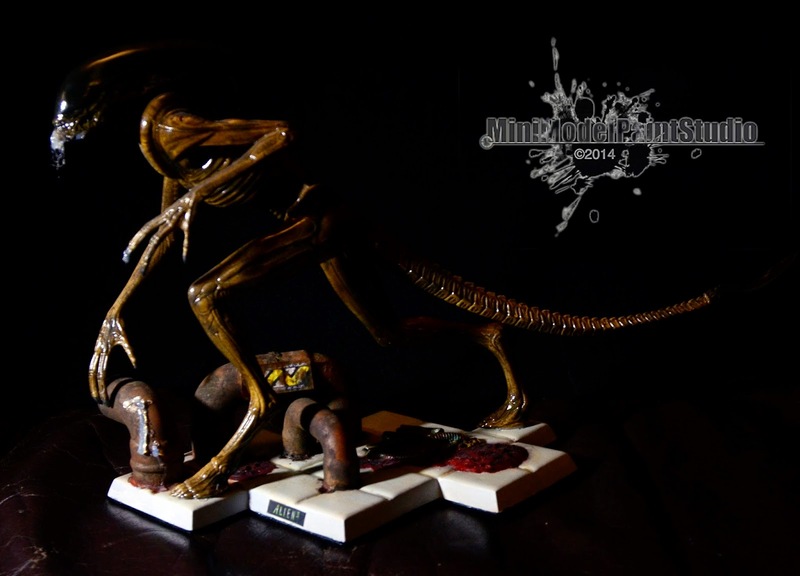 MiniModelPaint Studios: How to make a scary Alien diorama. Sometimes it take 10 years. 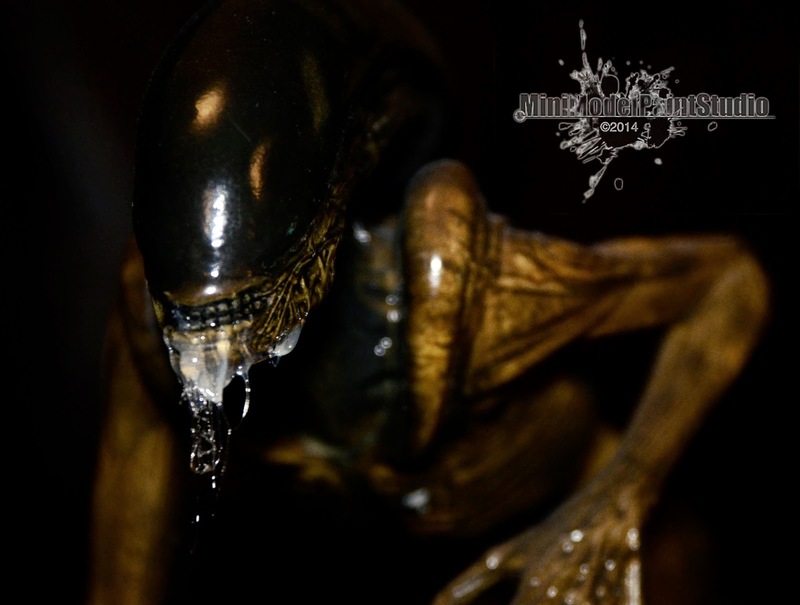 How to make a scary Alien diorama. Sometimes it take 10 years. I've been a fan of the Alien films since I was a teen. The Beatties chain of model shops in the UK used to stock what I considered to be the best array of model kits, from standard 1:72 Airfix planes to the most exciting kits - the sci-fi tie ins. They had AMT Star Trek and Batman kits, and the amazing Halcyon Movie Classics range - these were catnip for me. I went in every Saturday just to look at them. I saved up pocket money and bought one of the Back to the Future DeLorean kits. I desperately wanted the Alien kits, but they were expensive, and at the top of the range, the vinyl Face Hugger and Chest Burster kits were ridiculously pricey (£90 in 1992/3 wasn't even Christmas-present territory). Eventually, Beatties went out of business, and so did Halcyon. Finding my favourite kits was nigh-on impossible. About 10 years ago, I spent some time buying up my dream models on eBay - a decent stash of Halcyon and Aoshima Deloreans, ERTL Batmobiles, and Alien-related plastic, resin and vinyl now resides in my garage. Not all are quite as I remember, and very few live up to modern standards of tooling. Thankfully with a bit of experience under my belt, I now have the patience to overcome the challenges that these older kits often pose. Halcyon’s “Alien Creature” kit from Alien3 is beautifully detailed, especially for an early ‘90s injection moulded kit. The fitting of parts isn’t perfect, though - the spines along the tail need a lot of filling and filing, and the ribcage/abdominal insert needs to glued in place after the base colour is applied to the main body, and doesn’t quite fit. This, of course, is where it’s important to dry-fit and plan which glues and fillers to use before permanently attaching anything. The dome is a clear part. The intention here is to see the painted cranium detail through it, but it looked cheap and nasty. Even spraying Tamiya Smoke didn’t seem to help, which is a shame, because the moulding on the head under the dome is rather nice. Instead, I airbrushed various blends of dark browns and blacks for the main dome colour, and then freehand-airbrushed the kidney-shaped brain bits that would show through in stages of greys and sand tones. I then sprayed a coat of gloss varnish to seal the layer. Many, many layers of repetition of thin, transparent shadows, highlights and gloss followed, until I had built up a rich glossy texture with a sense of depth. There was a lot of trial and error involved, but the result is fun. I took a similar approach to the body. When I painted the figure my paints were mostly Vallejo Model Colour and Tamiya acrylics, and I airbrushed various mixes without keeping track of what I was using. The base colours are reddish browns, lifted by fine lines across much of the skin, giving that fiery look that makes this character stand out from its previous, darker, movie incarnations. Like the dome, these were created in layers locked by gloss varnish. The final effect gives the illusion of a more pronounced third dimension and movement in the light. I managed to get my hands on some Future acrylic floor finish from a friend in the States, and gave the whole figure a coat to protect it. It’s amazing stuff, but difficult to remove, so don’t make mistakes with it! The project then got put on hold for about eight years. Firstly, I didn’t quite know what I wanted to do with the base. I wanted to set a scene - not necessarily one directly from the film, but that would evoke multiple elements of it, as well as the whole franchise. Secondly, my ‘Hobby ADD’ had kicked in, and other projects had taken hold of my interest. The creature got boxed up, moved house a couple of times and was almost lost to old memories until I stumbled across its box in the garage in December 2013. Fired with a new direction to finish old projects, I started by repairing the tail, the tip which had broken off in transit. I drew some sketches, and decided on the elements that would be illustrated on the base: pipework; gore; slime; movie signage, and some kind of biomechanical nod to the original HR Giger artwork that made the films so successful. The provided base is tiled, but very plain. There’s a hole for the right leg at the rear of the base. I decided to use the base, rather than build something new, but to dress it up. First, I experimented with resin ‘splats’. Any time I mixed some resin for another project, I’d use the leftovers and flick them on different surfaces to see what chaotic results I’d get. They were cool, but not what I needed for slime or gore. At the very least, they provided slightly raised areas that broke up the stock tiling. I opted to spray the tiles white. Offwhite, really - to represent the medical bay sterility of the movie. They would be glossy, but dirty, too, with blood running through the seams. Once sprayed, I sealed the tiles with a layer of Future. To further offset the cleanliness and hygiene, I decided to add some industrial pipework. I needed two types of pipe - something large - as seen in the maintenance shafts in the film and something a bit more organic; a bit more Giger. Using Instant Mold, a reusable plastic press-moulding material, I took impressions of the flexible bits of drinking straws and made copies using Green Stuff. This took several days, as I only made two or three shapes to work with, but needed a dozen or more elements. In the meantime, I bought some copper pipe ends from the local DIY shop for a few pounds. The larger pipe was just about the right height for the creature to touch, like it was using it as a support while travelling through the prison colony tunnels. The ends of both types slot together, so I didn’t need to create any joining sections. I glued them, primed black and then sprayed various shades, starting with a mixed-down concoction of oranges and light browns. I wanted these to end up rusty and gritty. When dry, I fixed them to the tiles. In hindsight, I should have extended the pipes downwards and cut holes in the plastic base. As it is, they’re held tight on the surface with both Green Stuff and JB Weld epoxy fillers. Of course, the adhesives spread onto the tiles from under the pipes, but I turned the unsightly join to my advantage. It turns out that if you add a few drops of CA glue to PVA, the resulting coagulation looks like brain splatter. It also sets rock-hard (although the fumes are quite nasty, so wear a mask). There are many methods to style this goop while it’s setting, but I settled for a simple porridge-stirring. I created this around the base of the pipes to cover the epoxy over-spread. I also put a big dollop in the middle of the tiles, and added the flexi-straw copies to create the biomechanical splatter detail I’d been looking for. It was at this time that Games Workshop released some new ‘technical paints’. Some of these were very handy. Blood for the Blood God is a thick, glossy, deep red that always look like fresh gore. This was used copiously over the PVA splatter areas, and shaded with black and brown washes to add depth. I used Games Workshop’s Typhus Corrosion paint to dirty-up the pipes. More than just a wash, Typhus Corrosion has tiny specs of grit mixed in with the pigment. It dries matte, leaving a fantastic rough texture. Used in conjunction with Ryza Rust, an orange tone developed for drybrushing, you can achieve a very realistic scale rust effect. One of the running themes of the Alien films is the greed and power of the ‘The Company’. The Weyland-Yutani Corporation, only hinted at in the original movie, gets revised signage in James Cameron’s sequel, Aliens. The W-Y logo is then seen throughout the franchise, including the current crop of prequels and video games. It’s only fitting, then, that ‘The Company’ gets a mention somewhere in this piece. I created a logo in Photoshop from web references, and printed a page of differently sized rectangles. Cutting the best sized logo from the page, I glued it to a piece of thick stamped foil - cut from a coffee can freshness lid (very handy to keep these). I then made a mistake, spraying the paper with satin varnish to seal the ink. Instead of protecting the printout, the spray melted the ink and left it with a grey film. I waited until it was completely dry and then repainted the black and yellow areas. This cleaned up the damage created by the spray, but left the sign looking too crisp and new. Out came the Typhus Corrosion, Ryza Rust and some straight silver to weather the sign - grime, rust and scratches put the sign in context with the rest of the scene. The metal backing made it easy to glue the sign in place and bend it into shape, giving it the look of many years of service. The Alien3 title logo on the base suffered from the spray at the same time as the W-Y sign. Of course, I had already glued the paper to the plastic base, so freehanding the black and blended greens was a nervous job! Once the top base was finished, I covered the underside of the base with plasticard, and then black felt. I like to have a soft under-surface so not to scratch any furniture it’s left on. I then glued the creature in place. A hot-glue gun was my weapon of choice this time. It was a decision based on convenience more than anything, because the last job of all was the slime - the creatures in the films drool everywhere! Hot glue was the perfect finishing touch for the mouth, and I left some drips on the pipes, too. This project has been overlong, but really enjoyable. The techniques I’ve learned while creating this diorama have pushed my abilities, and forced me to think more creatively to solve certain problems. I’m happy to have finally completed a model I hankered after for so long!